Thirteen years is a long time to wait...wouldn't you agree? That's how long Joseph waited for the fulfillment of his dreams to come to pass. During those long years we know how faithful Joseph was in his walk with God. We also know how God made Joseph prosper wherever he was at - from his time in the prison to his promotion into the palace. Imagine the shock Joseph must have felt when he comes face-to-face with his brothers again. You remember...the ones who wanted to kill him, but sold him to the Ishmaelites. Have they come after all this time to kill him? Why are they here now...after all this time? I can just imagine all the questions racing through Joseph's mind. Joseph has a right to be cautious, don't you think?! The questions Joseph asks of his brothers give him the answers he needs to calm his curiosity. And in the end, his final test involving his favoritism of Benjamin during their meal in order to settle in Joseph's mind the true condition of his brothers' hearts, brings about a beautiful reconciliation. Fulfilled dreams and changed hearts in the hands of a faithful God and in His perfect timing. God is able to do the same for you. Is there a dream God has given to you? Be faithful where He has placed you in this moment. Do you need a change of heart? Surrender yourself to the One Who surrendered all for you...His name is Jesus. He can do more with a surrendered heart than you ever thought possible. Scripture: Genesis 42:6 Now Joseph was governor over the land; and it was he who sold to all the people of the land. And Joseph’s brothers came and bowed down before him with their faces to the earth. Observations: We see here the fulfillment of Joseph’s first dream we read about in Genesis 37:5-8. Application: We can be assured that God’s plans for our lives will come to pass. Prayer: Heavenly Father, thank You for Your faithfulness. Every word that You have spoken will surely come to pass in Your perfect timing. Help us to keep our eyes on You while we wait for Your plans to be accomplished in our lives. Help us to trust You in all the circumstances that come our way believing that You are using every circumstance to shape us into the vessel You desire for us to be. In the life-changing name of Jesus I pray. Amen! Scripture: Genesis 43:34 Then he took servings to them from before him, but Benjamin’s serving was five times as much as any of theirs. So they drank and were merry with him. Observations: In this test of his brothers' reactions, Joseph shows favoritism towards his brother Benjamin by serving him five times as much as he served the others. That “they drank and were merry with him” indicates to Joseph a true change of their hearts. Application: When our hearts are truly repentant, there will be a change in our behavior. Others will be able to tell by our actions that we have turned away from the things that grieve the heart of God. Prayer: Heavenly Father, I thank You for turning my heart of stone into a heart of flesh that is surrendered to Your will. I desire to live my life to bring honor and glory to Your name alone. I pray that when others see me they will see a woman who is surrendered to the power of the Holy Spirit working in her heart and life. Thank You for Your forgiveness that covers me. Help me to share Your love and Your forgiveness to all who You place in my path. May they, too, be drawn to Your heart in total surrender to Your will for their lives. In the life-changing name of Jesus I pray. Amen! Here's our reading plan for the rest of the week. I'll be back on Friday with another Blogging Through the Bible post! 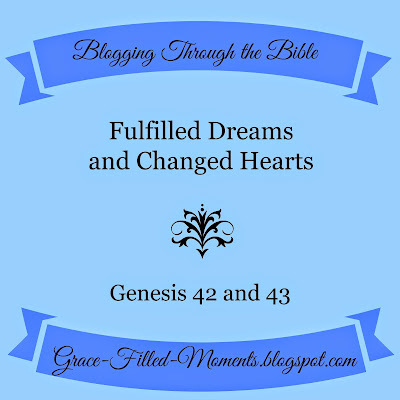 Has God placed a dream in your heart? 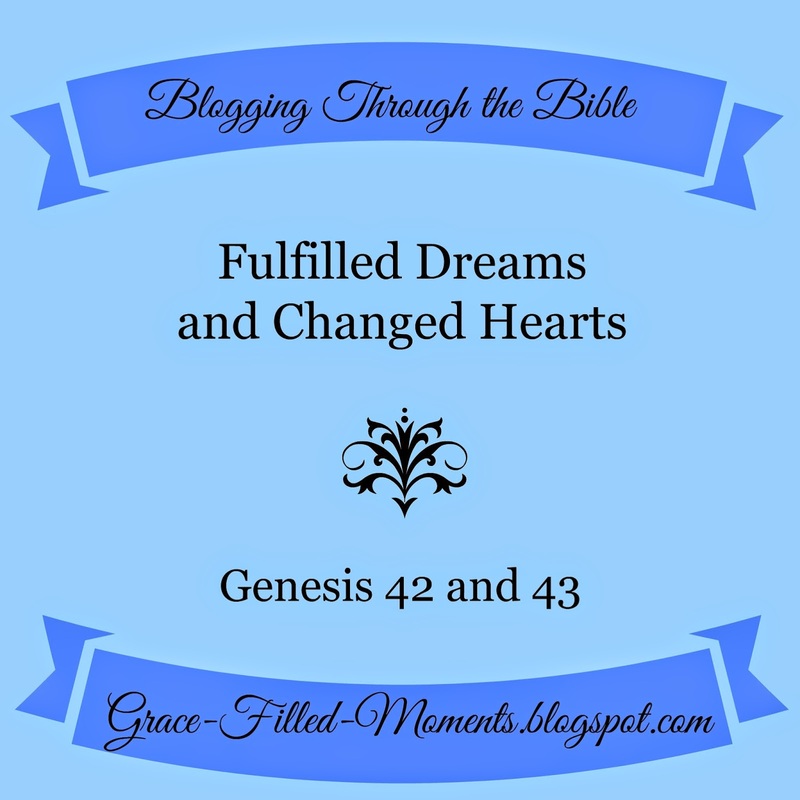 Has God fulfilled a dream for you? Please share! Do you need a change of heart? How can I pray for you?